St. Peter’s College Bambalapitiya who defeated St. Anthony’s College Kandy after a one sided affair in their Milo President trophy inter-school rugby knockout championship quarterfinal match at Royal Sports Complex are one step away from qualifying for the finals. Peter’s were expected to be given a tough fight by Anthony’s but it turned out to be a one sided match as the Peterites came on top against a St. Anthony’s outfit, who have failed to live upto expectations. 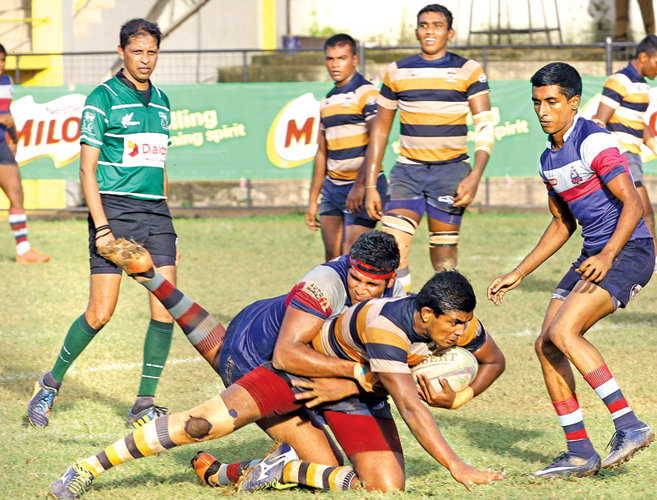 St. Peter’s acting captain and nippy scrum half Jason Karunaratne led from the front. He created the openings for many tries in their 39-12 win and he has been playing really well throughout the season. Their two centres the Madushanka brothers Dilshan and Rukshan along with full back Shehan Liyanapathirana, flanker Sunera Fernando and hard working fly half Kenneth Wimaladasa too were in the thick of the game and added their names to the try list. The Peterites who meet Wesley in Sunday’s second semi-final are now one of the favourites to win the championship along with defending champions St. Joseph’s and Kingswood who are scheduled to meet in the first semi-final on Saturday. St. Joseph’s beat Maliyadeva College Kurunegala by 45 points to 17 in another one-sided quarterfinal at the Sugathadasa Stadium. The Josephians defended with a lot of heart which paid off in the end. Wesley College pulled off a stunning win in their quarterfinal match against much fancied Isipathana College by 22 points to 15 also at the Sugathadasa Stadium. Wesley’s young hero was wing three quarter Kavindana Perera who scored two tries with co-winger Mohandas Paranitharan scoring the match winning try after the scores were deadlocked at 15-all. Kingswood College Kandy caused the other quarterfinal shock when they beat their home town rivals Trinity College Kandy by 24 points to 15 at Nittawala.